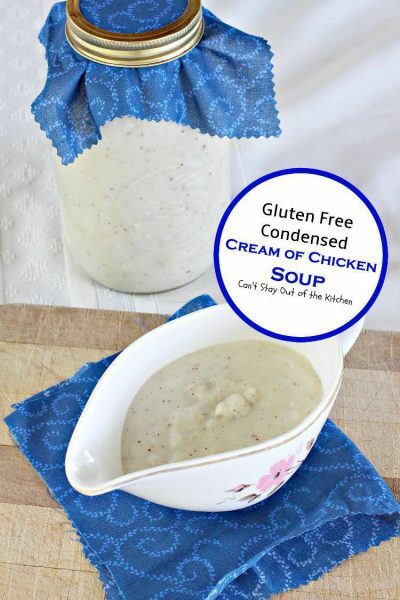 Gluten Free Condensed Cream of Chicken Soup is wonderful. I love this healthy version of canned Cream of Chicken Soup. 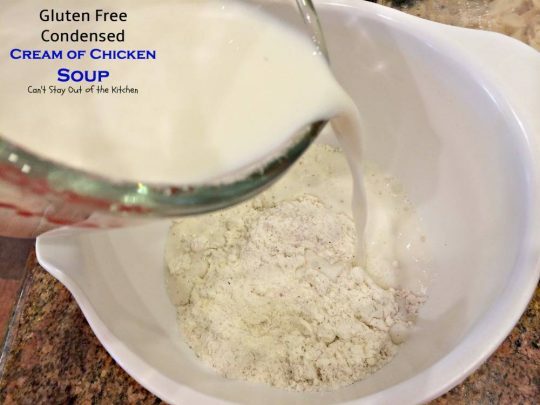 While I have made this recipe with regular flour, I really prefer making it with gluten free flour and using this condensed soup in recipes to replace canned Cream of Chicken Soup which is filled with preservatives, high fructose corn syrup, MSG, and other fillers which are dangerous to my health. 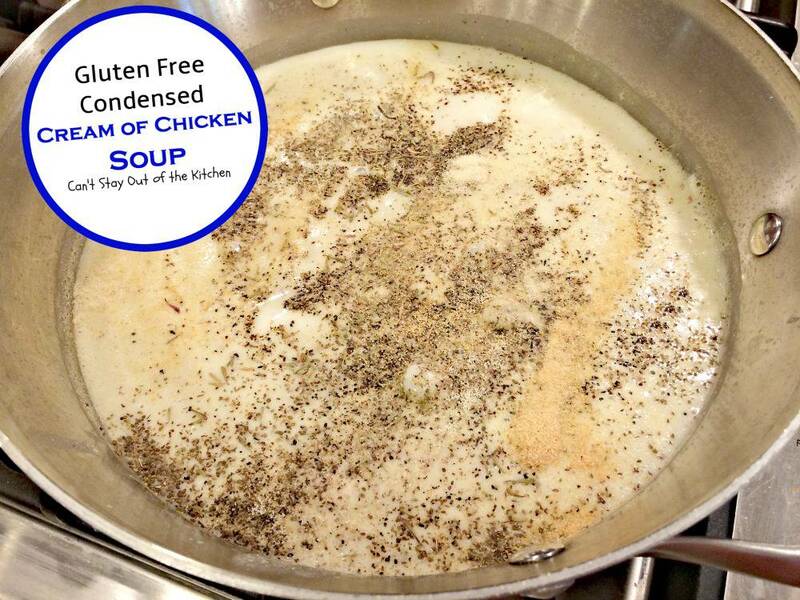 I’ve made Gluten Free Condensed Cream of Chicken Soup several times now with great success so I figured it was time I went ahead and offered a post on it for my gluten free and health-conscious blog followers. I’ve used this tasty soup recipe in my Chicken and Dumpling Casserole recipe and my Chicken and Dumpling Casserole with Veggies. I recently remade this recipe to use with my Dove’s Nest Fresh Squash Soup recipe (to be posted later) and it was wonderful in that recipe, too. Anytime I can substitute healthier option for canned soups, I prefer to do that. I have SO many recipes with canned soups, so making my own versions of Cream of Chicken, Cream of Celery, and Cream of Mushroom soups is becoming a necessity now that I want to eat healthier. This recipe is REALLY easy. While my picture shows a can of chicken, I actually ended up using some rotisserie chicken my husband brought after I took this picture. But if you’re cooking off a chicken and using your own homemade chicken stock that’s one of the easiest ways to make up this recipe. Otherwise, use canned or rotisserie chicken and chicken broth as I’ve done here. This recipe only takes a few minutes to make. Did I say it’s super E-A-S-Y? Seriously. Sometimes you just don’t have time to make everything from scratch, but this recipe is sure a great start. 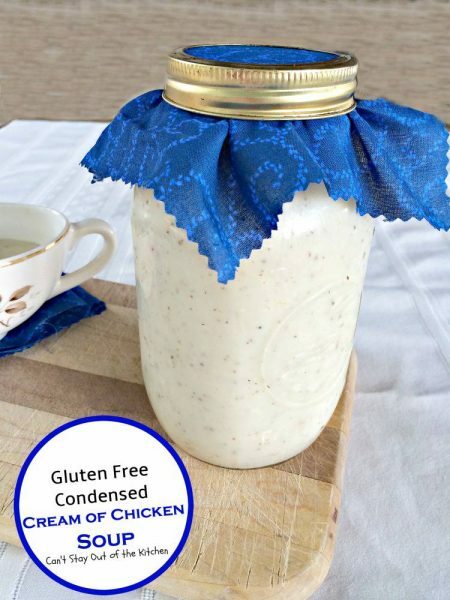 There are plenty of Homemade Condensed Cream of Chicken Soup recipes available online these days and I’ve pinned several of them. But I really liked the taste of the seasonings in this one. 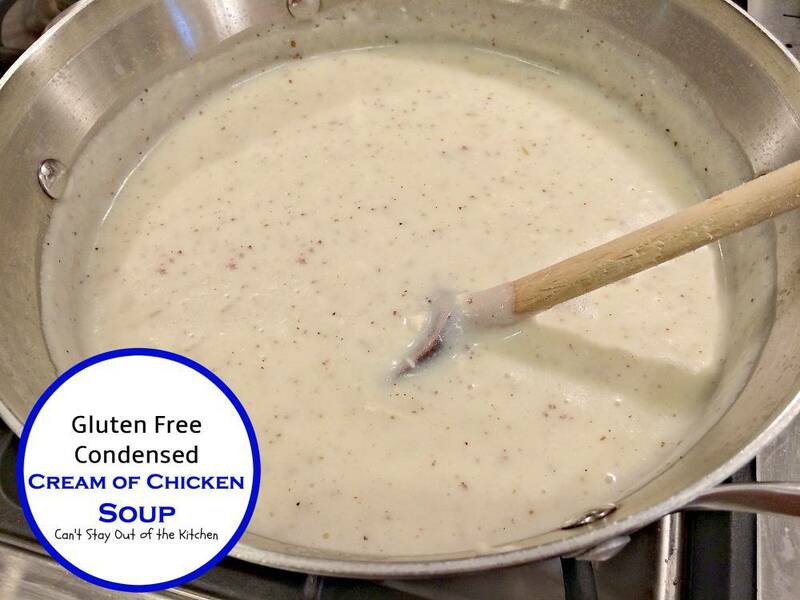 The fragrant seasonings used in the recipe make this soup awesome and a great sauce/soup to use as a starter in any casserole dish. Again, if your aim is healthy, then this recipe is worth a try. 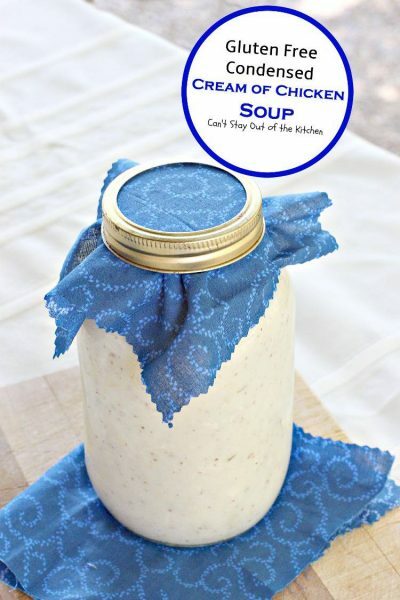 I’m sure this soup can be canned with a pressure canner or a boiling water bath if you follow the directions from canning books. I have heard that it can be frozen as well. This soup will only last a couple of days in your refrigerator, and then you need to use it up. 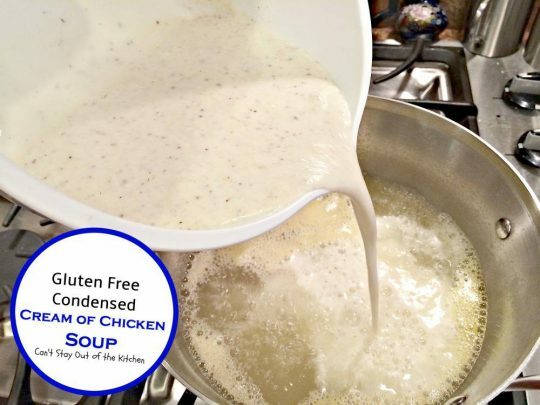 My batch made 40 ounces of cream of chicken soup, so you can easily cut that back if you don’t need as much for your recipes. This is a condensed soup recipe, meant to be used as a substitute for canned Cream of Chicken soup, not to be eaten as is. 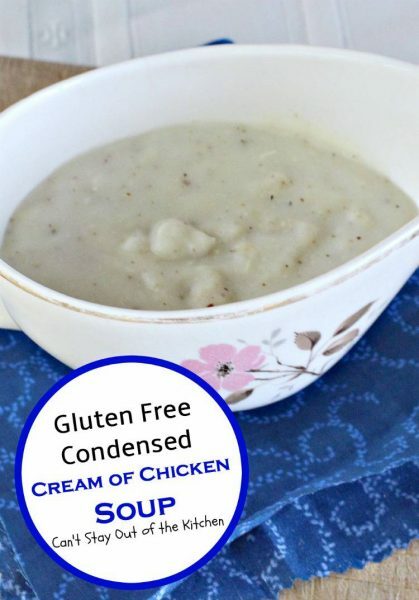 If you want a healthy gluten free version of Condensed Cream of Chicken Soup, this one is one of the best I’ve come across. I do recommend that you don’t scrimp out on the seasonings. If you’re going to go to all the bother of making a homemade version, go out and purchase celery seed and the other seasonings needed to make this soup superb. I used Pamela’s Gluten Free Baking and Pancake Mix as a substitute for regular all-purpose flour, because that’s what I had on hand. The soup turned out wonderfully. You can also use Bob’s Red Mill all-purpose gluten free baking mix which I’ve used before, or any number of great gluten free flours on the market these days. You can also use this great recipe as a starter for soups you may want to make adding the veggies, pasta or potatoes or meat of your choice. There are many different options for using this versatile recipe. 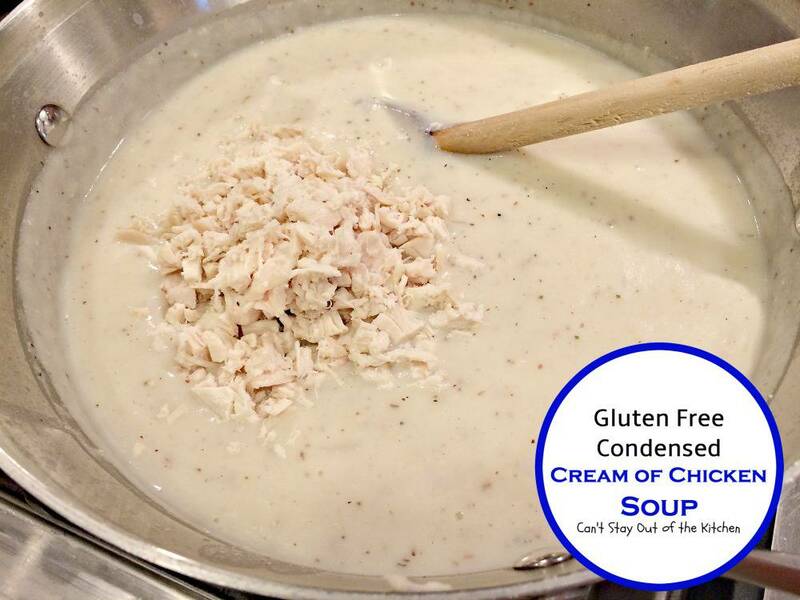 Gluten Free Condensed Cream of Chicken Soup is a healthy, delicious, homemade version of canned Cream of Chicken Soup. 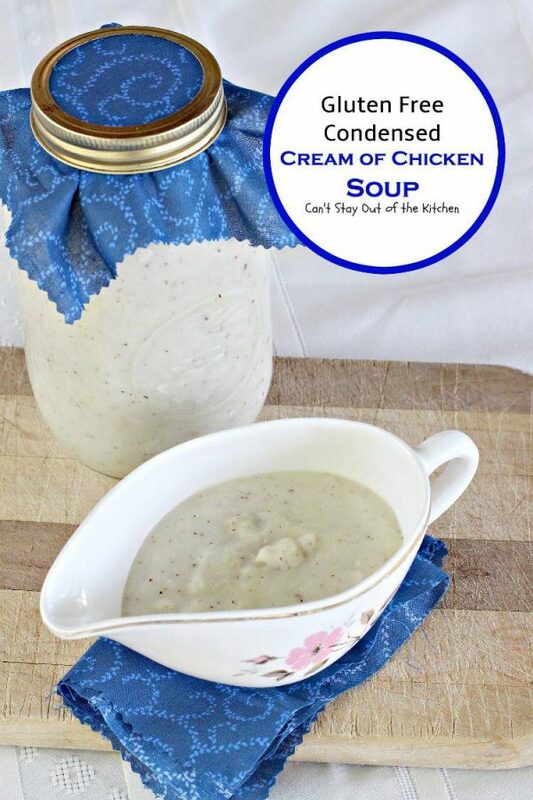 This really quick soup can be added to any recipe calling for canned Cream of Chicken soup. 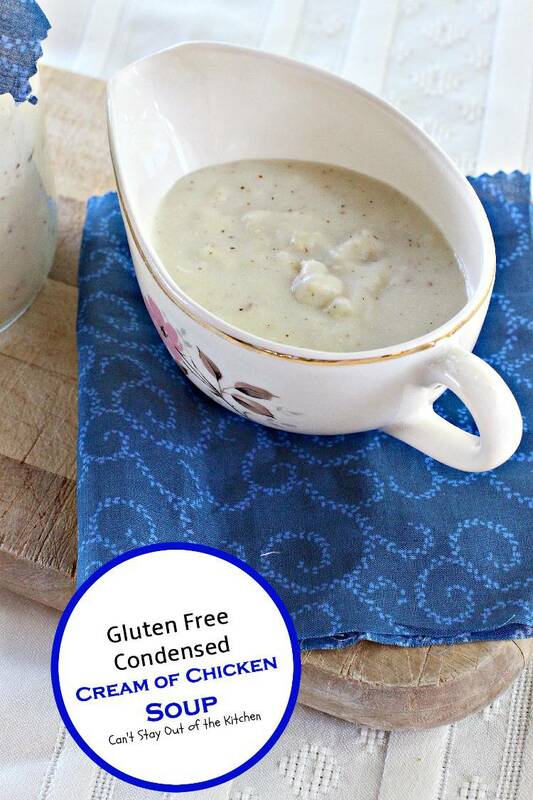 I love having a healthy, gluten free version of condensed Cream of Chicken Soup. This recipe is so easy to make, too. I used these ingredients. Leftover chicken or rotisserie chicken works really well. Pour chicken broth into a small saucepan and bring to a boil. Meanwhile, pour gluten free flour into a mixing bowl. Add milk. Add gluten free flour mixture to boiling chicken broth. Stir to combine. Reduce heat. Add seasonings. Cook a couple of minutes until mixture thickens. Add finely diced chicken. Stir to combine and heat through a minute or two. Heat through and use as needed as a substitute for condensed Cream of Chicken Soup. 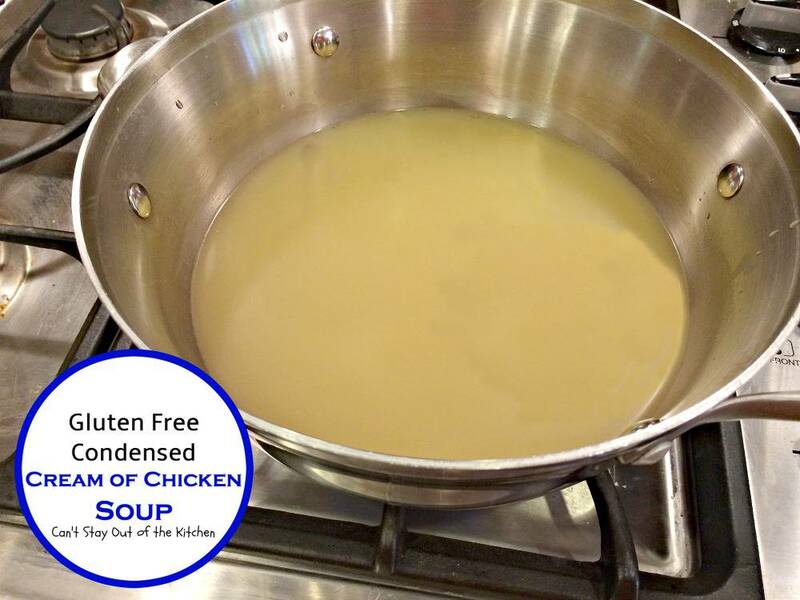 If you have cooked chicken and chicken broth on hand, this recipe can be made up in less than 10 minutes! 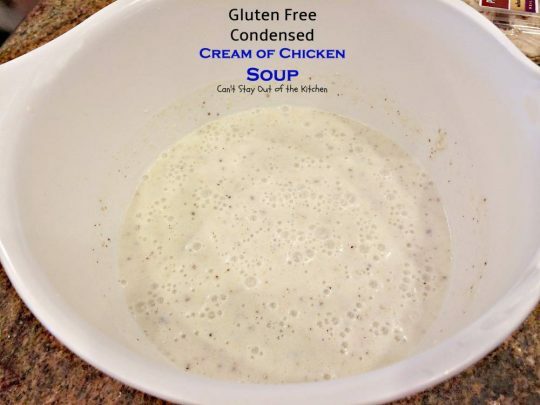 Follow the directions in your canning cookbooks to can Gluten Free Condensed Cream of Chicken Soup, or try freezing it. Excellent replacement for condensed Cream of Chicken Soup in recipes using canned soups. Pour chicken stock into a medium sized saucepan and heat over medium heat until boiling. 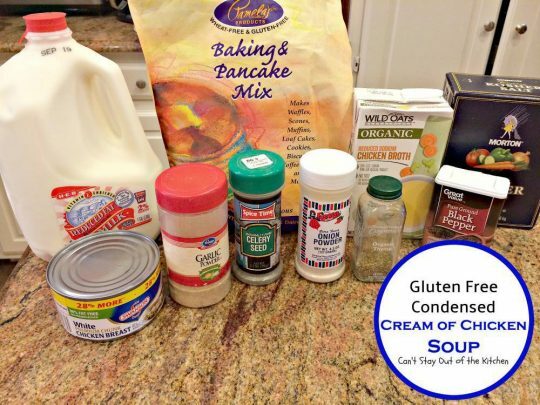 Combine milk and baking mix with a whisk. Pour into boiling chicken broth. Reduce heat, add seasonings, and cook a couple of minutes until thickened. Stir in chicken and heat through. Makes about 5 cups condensed cream of chicken soup. 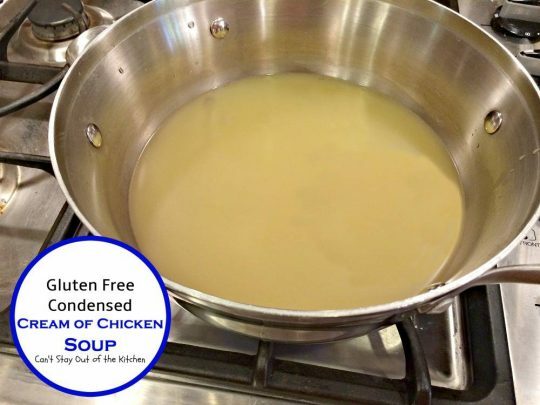 NOTE: This homemade condensed soup is made without preservatives, MSG or other fillers and can be substituted for canned cream of chicken soup in recipes. You will need about 1 ¼ cups to substitute for one can of cream of chicken soup. NOTE: This soup needs to be used up immediately or refrigerate and use within 48 hours. 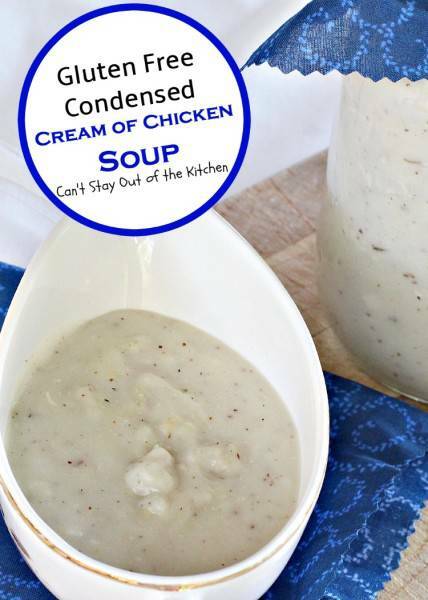 This homemade condensed soup is made without preservatives, MSG or other fillers and can be substituted for canned cream of chicken soup in recipes. You will need about 1 ¼ cups to substitute for one can of cream of chicken soup. [br][br]This soup needs to be used up immediately or refrigerate and use within 48 hours. I love preparing food for my family that I know is not filled with MSG, high fructose corn syrup, soy oils and proteins or other GMO products. It’s hard to do that sometimes, but whenever possible I try to make the effort. Gluten Free Condensed Cream of Chicken Soup is a great alternative to canned soup and can be used as a starter in many casserole recipes! I love this recipe and would like to know if it can be frozen? I’m not sure, Gail. I’m sure you could can it if you used a pressure canner, but if you try to freeze it, the mixture may not reconstitute very well. It may end up grainy and separating. I’m glad you love the recipe. I think it’s a great one, too. That’s great blog!Thanks so much for posting these wonderful recipes. I can not wait to try some of your amazing recipes.